On June 2, 2011, the U.S. Department of Agriculture released the long-awaited replacement for the Food Pyramid. 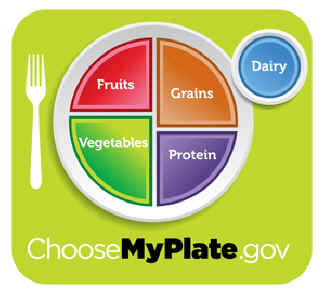 The new MyPlate icon is a plate, somewhat similar to the Power Plate developed and released by PCRM more than a year ago. To consume a diet that contains enough, but not too much, protein, simply replace animal products with grains, vegetables, legumes (peas, beans, and lentils), and fruits. As long as one is eating a variety of plant foods in sufficient quantity to maintain one’s weight, the body gets plenty of protein. The most healthful calcium sources are green leafy vegetables and legumes, or "greens and beans" for short. If you are looking for a very concentrated calcium source, calcium-fortified orange or apple juices contain 300 milligrams or more of calcium per cup in a highly absorbable form. Many people prefer calcium supplements, which are now widely available. 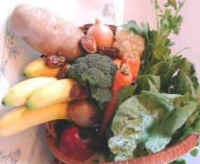 Iron is abundant in plant-based diets. Beans, dark green vegetables, dried fruits, blackstrap molasses, nuts and seeds, and whole grain or fortified breads and cereals all contain plenty of iron. The natural source of vitamin D is sunlight. In colder climates during the winter months the sun may not be able to provide adequate vitamin D. During this time the diet must be able to provide vitamin D. Fortified cereals, grains, bread, orange juice, and soy- or rice milk are healthful foods that provide vitamin D. All common multiple vitamins also provide vitamin D.
B12 needs can easily be met by consuming a variety of vegan foods. Fortified breakfast cereals, fortified soymilk, and fortified meat analogues contain a reliable source of the vitamin.